It seems that 2015 was the year the team at Rocks Brewing really started stretching its brewing muscles in earnest. Its core range, from pale through porter, has been well and truly nailed down, so they started playing around with fruit beers, barrel-aged beers and sour beers (sometimes all three within the same vessel), releasing brews made with cherry, lychee, pomegranate, passionfruit and more. That’s something they’ve carried on to 2016, with the first limited release of the year being a blueberry witbier. Visually, it’s very striking. The addition of the fresh fruit to a light wheat malt bill has left it bright and vibrant, somewhere on the colour palette between pink, red and crimson. Were you to drink with your eyes, its cordial-like appearance might warn you to be cautious of a full-on assault of fruity sweetness. Reality is much gentler. In the spectrum of commonly consumed berries, blueberries don’t tend to be the most aggressively sweet variety, often providing little spheres of interest in your muffin or colour to a stack of pancakes. Similarly, their impact here – colour aside – is more subtle and refreshing; a very light sweetness and the faintest touch of tartness. Four hops – Super Alpha, Mandarina Bavaria, Nelson Sauvin and Pacific Gem – have been used but these too are used with restraint. Even the typical esters and haze of a classic wheat beer are subdued, ensuring that no element in this beer goes too far in any direction. For a regular Rocks drinker raised on a diet of the brewery’s flagship pale ale or lager, this may seem a quite unusual beer. 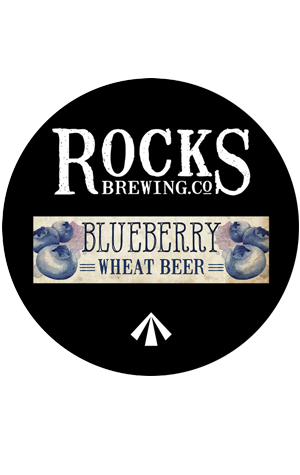 But, while different, the blueberry wheat may actually be even more approachable than both of them. For those seeking more complexity, keep your eyes peeled for a re-release of sorts later in the year as a barrel has been filled with the blueberry wheat and will be left to age and develop more sour and fruity funk.